Chinese herbal medicine (CHM) has been used for treating insomnia for centuries. The most used CHM for insomnia was Polygonum multiflorum. 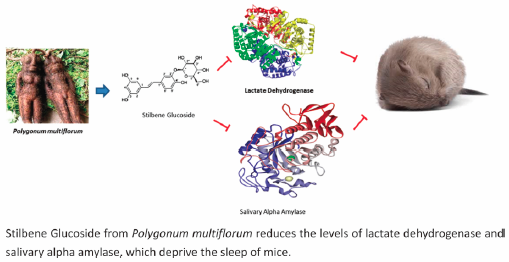 However, the molecular mechanism for CHM preventing insomnia is unknown. Stilbene glucoside (THSG), an important active component of P. multiflorum, may play an important role for treating insomnia. To test the hypothesis, Kunming mice were treated with different dosages of THSG. To examine the sleep duration, a computer-controlled sleep-wake detection system was implemented. Electroencephalogram (EEG) and electromyogram (EMG) electrodes were implanted to determine sleep-wake state. RT-PCR and Western blot was used to measure the levels of lactate dehydrogenase (LDH) and saliva alpha amylase. Spearman’s rank correlation coefficient was used to identify the strength of correlation between the variables. The results showed that THSG significantly prolonged the sleep time of the mice (p<0.01). THSG changed sleep profile by reducing wake and rapid eye movement (REM) period, and increasing non-REM period. RT-PCR and Western blot analysis showed that THSG could down-regulate the levels of LDH and saliva alpha amylase (p<0.05). The level of lactate and glucose was positively related with the activity of LDH and saliva alpha amylase (p<0.05), respectively. On the other hand, the activities of LDH and amylase were negatively associated with sleep duration (p<0.05). The levels of lactate and glucose affect sleep homeostasis. Thus, THSG may prevent insomnia by regulating sleep duration via LDH and salivary alpha amylase.